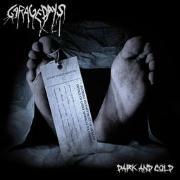 Austrian Old School thrash/power metal quartet GARAGEDAYS release their eagerly promoted debut. Marco Kern, guitars/vocals, founded GARAGEDAYS in 2005. Many lineups later he was surrounded by lead guitarist Rene Auer, bass player Dominik Eder and drummer Matthias Mai. The band has issued a demo, “Wild and Dangerous”, before making two albums; “Sight of the Blind” and “Dark and Cold”. The latter has been chosen as their Massacre Records debut. After opener “Last Breath” I was a happy reviewer. Imagine that it took four Austrians to follow up on METALLICA`S success…and about 25 years. The following six tracks are also pleasant, but not quite in the same division. The mix of acoustic and gentle electric guitars is used in “Father”, “Four” and “Conscience”. A concept that has served many well over the years, but it doesn´t have quite the edge that is required to break a new band. “Blow Away” might be something of what made METALLICA big, and “I´m Your Hate” might be close to MEGADETH, but close is all that GARAGEDAYS musters this time around. The second part of the album is by far the least good. The foremost oddity is represented by the oddly short, or overlong, depending on which way you see it, “Black Bridges”. It´s marred by gloom and shrieks, and a strangely muffled guitar sound. The title track is also lacking, this time in the refrain department. It is too repetitive, and feels recycled from the glory days. GARAGEDAYS may well have the best motifs and intentions, but this is simply not enough to go places…not this time around.